What are the odds that you spot a newly opened food space serving Greek cuisine in a busy mall? I would say, very rare. A weekend outing had me visiting a week old ERGON Singapore in the sprawling Suntec City Mall . ERGON Foods has a global presence and is known for its branded products and deli-style restaurants. The warm-lit cafe with its aesthetically done interior is a welcome sight to sore eyes. There are tall shelves stocked with authentic Greek ingredients that almost seem like an introduction to a Greek food library. From marinated olives to feta spreads, from premium olive oil to Greek wines, from oat and barley rusks to bread sticks – there is an extensive variety of products pertaining to Greek cuisine that can be found here. The seating space is spread out well so that you can look at these ingredients as you wait for your order. The menu was as interesting as the food items and desserts that could be seen on the display counter. Let me add that if you have a sweet tooth, you will love the desserts that this place has to offer. They have launched two menus: One for the brunch and daytime and the other is the dinner menu. For us, it is almost mandatory to try a feta cheese dish when we eat Greek food. So we ordered the ‘Spinach and Feta Cheese Pie’ which is a classic combination. The phyllo pastry was perfectly flaky which was great to bite into and the non-soggy spinach cooked just right made it a good dish. The feta cheese balanced the salty component of the dish. We also ordered the Koulouri which is Greek street food. The dish was presented as a crisp and chewy sesame bagel served on a bed of Greek yogurt and topped with two eggs. The yogurt seems like an unlikely addition – but it works wonderfully in the dish. The dish has great contrasting textures from the bread, egg and yogurt. There’s supposed to be a spicy oil but the dish isn’t spicy at all. Recommended. There are some interesting beverages to be tried out at Ergon. Since I had never tried Greek coffee, I promptly ordered the ‘Freddo Cappuccino’ which falls under the iced coffee category. Its one cool coffee topped off with delicious cream and was visually appealing. Taste-wise, it will remind you of a milkshake and is not rich or heavy. Overall, highly recommended. In Greek culture, the desserts are as important as the meal. One of the best Greek desserts to try is Bougatsa , also known as the sweet milk cream pie. This dessert was made up of scrumptious pastry and filled with custard and topped off with icing sugar. The dish was served warm and that added to the taste and was very good. Since it was cut into small cubes, it also became very easy to eat with a fork. Forget the calories for a change and try it. Highly recommended. Baklava is a dessert of the Middle East and Mediterranean, and it has numerous variations depending on the country of origin. The ERGON version was sweet and nutty and the filling had a slightly chilled taste. The phyllo pastry was a bit difficult to cut into and hence would have been better to serve it in small cubes. The portion size is large enough for two people to share and is quite rich. They also have a small bites counter which has delectable items in offering. The Chocolate with Tahini roll topped off with white sesame seeds is divine, do try it. If you don’t mind eggs used in desserts or in flour, this place has quite a few vegetarian options. There are also quite a few vegetarian sandwiches on the menu. We’ll definitely be visiting again to try out the dinner menu. The service is quite friendly and the owners also take an effort to mingle with the crowd and get feedback since these are the initial days. The place has promise and we hope that the quality is maintained in the long run. For its authentic Greek cuisine offering, for its lovey ambiance, for its desserts and for its central location, ERGON Singapore is definitely worth a visit. More often than not, we look for healthy lunch or dinner options after an indulgent weekend. Salad bars fit perfectly into this mindset and you end up getting a lean and green dining experience. Thus, on a healthy note, I made my way to Green Bar, a gourmet salad bar situated in Millenia Walk. Frequented by business executives working in the area, this place is crowded during lunch time. It seats no more than 15-20 pax. If you are in a hurry, they have takeaways as well. They have limited options for vegetarians on the standard menu – but what works is the fact that you can customize your own salad with different combinations of dressings. The queuing system uses a display number token system which makes it organized – though during lunch time it ends up in a bit of order confusion. Salads can be made to taste interesting by creating different flavour profiles and combining textures. We ordered the ‘Moroccan Couscous Salad’ as the focus was to get more fibre and less fat. This salad was a mini-adventure of raisins, chickpeas and olives in buttered couscous on a bed of baby spinach and arugula leaves. This was finally drizzled off with a lemon dill dressing which was top-notch. What was striking was the large wooden serving bowls – and the quantity of the serving was perfect for lunch. The salted cashews on the side lent a nice balance to the sweet raisins. Bread (which can be dipped in olive oil) is served on the side and this was a good wholesome meal. For those who are fan of grilled veggies, the ‘Grilled Veggie Foursome’ is a riot of colours with red bell peppers, mushrooms, zucchini and tomatoes. If you are wondering what makes this combination work – it’s when all these ingredients come together with the coriander pesto dressing. The ingredients used are fresh which imparts a crunch to the vegetables – both leafy and non-leafy. If required, extra bread can be taken at the bread bar. On the whole, the salads might seem a bit pricey but that could mainly be because of the location and the sourcing of high quality ingredients. For its gourmet salad concept, for the portion sizes and for a healthy but tasty meal, the Green Bar is worth a visit if you are in the area. Far from their distant location of Grandstand, Pasarbella has opened their second gourmet food market at Suntec City. Conveniently located near Promenade MRT, this place lights up in the evening with a huge signboard that you just can’t miss. Across a sprawling 7000 sq ft, 15 gourmet stalls wait to serve you their best dishes. The decor is industrial-chic meets food-court with ample seating. Since we scouted for vegetarian options, I am sharing the stalls in which I managed to find them conveniently. Grillo is a Japanese Yakitori stall specializing in skewers along with their house-blended sauces. To begin with, I ordered the ‘Sweet Potato Fries’ as the starter. The fries were appropriately crunchy and salted and you can take a chilli dip as the side. If you are looking for a delish bowl of rice, then this ‘Garlic Tofu Bowl’ fits the bill. First ensure that you like the ingredients and the taste of garlic is not overwhelming. The ‘Zucchini Skewers’ on top were crunchy and went with the soy-sauce drizzled rice. I would have liked a bit more veggies to balance the rice in the dish. I have a weakness for salad stalls brimming with fresh ingredients. ‘Pimp My Salad’ does not disappoint with its options. A neat ordering form is provided where you can mark your choices and customize your own salad. With glee, I filled the checklist and created my salad carefully choosing the ingredients. They also have their signature salads with interesting combinations. If you are a fan of healthy eating and enjoy salads, I would highly recommend this bowl of goodness. Vegetarians and vegans, you can go crazy choosing your preferences. Look at my choice – Broccoli with Almond Flakes and Chilli, Baby Corn with Paprika, Pomegranate, Hummus, Garam Masala Chickpeas and Couscous with Raisins and Bell Peppers. And everything was rightly flavored and so tasty! Next we hit the ‘Pita and Olives’ stall. It is a Mediterranean-style bistro dishing out hearty food in the form of pita bread, kebabs and falafels. Their food is not new to me as I have reviewed them earlier which can be read here . They have closed their outlet at Tanjong Pagar and moved to Suntec City and serve some tasty dishes. I particularly like their Falafels and generally order their platter which can be shared by 2 pax. Their Hummus and Salad are delicious! If you like rice for lunch or dinner, then go for their Pilaf Set which is filling and take falafels on the side. Instead of the usual savory items, ‘Sarnies@Suntec’ serves coffee, pastries, tea and milkshakes. They also have the non-dairy form of drinks. Along with this they are selling ‘Cocowhip’ which is a vegan soft serve from Australia. This ice cream is made from coconut water and there is a pronounced coconut taste when you dig into it. You can choose your sauce toppings to give it a variety in flavour and I chose Burnt Caramel Sauce which was damn good! Last but not least, ‘Squeeezed’ serves some awesome fresh juices. An appropriate stall in this setting, especially with the Singapore weather. They serve cold-pressed juices packed with vitamins. I felt refreshed after drinking this juice. For its central location, its variety of food stalls and decent lunch and dinner options, Pasarbella is worth visiting! Once in a while you come across a place that has a combination of interesting cuisine and umpteen choices on the menu. And Pita Pan is exactly that, a 98% vegetarian joint that provides you with numerous options for a filling lunch or dinner. I say 98% because eggs are used in the Mediterranean breeze section of their menu. I went to their Bayfront outlet which has limited seating (approx 30 seats), hence advance reservation is recommended. For a clearer idea of their location, look for the ‘Coffee Bean and Tea Leaf’ or the ‘Lady M’ outlets. The eatery is managed by an Indian couple and they are passionate about the joint and ensure that your needs are met. The concept is of self-service – you have to go and place your order at the counter and decide on what you want to eat. The colourful salad bar on display while ordering is quite fresh. To begin with, we went for the healthy serving of ‘Couscous and Soup’. It was filled with vegetables like carrots, cabbage, onions and chickpeas and was quite tasty. 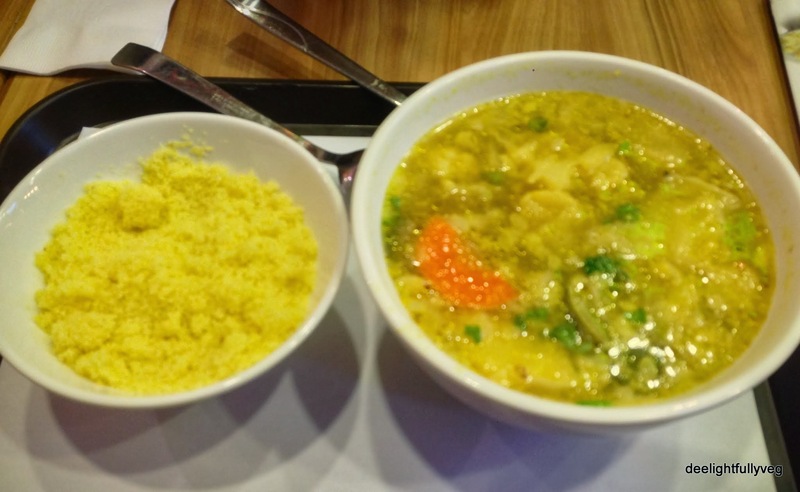 Couscous is typically found in Mediterranean offerings and it is mainly a combination of wheat flour and semolina flakes and served as a befitting complement to the soup. The pocket meal options mentioned on the menu were quite tempting and we ordered the ‘Full Pocket Meal with Falafel’ since a Mediterranean outing without falafel would have seemed incomplete. 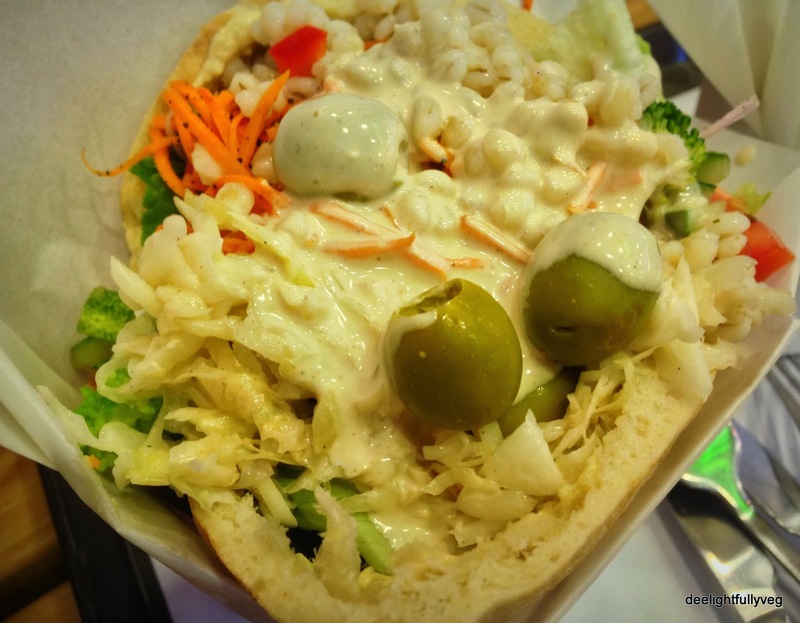 This had five crispy falafel pieces inside packed into a huge pita bread filled with fresh vegetables and toppings of your choice and served in a neat tub-shaped box. The falafel was crunchy on the outside and quite soft on the inside and it was delicious. Totally not to be missed if you visit here. The orders continued with the selection of ‘Full Pocket Meal with Veg Shawarma’ which also turned out to be a hit. The serving concept is exactly the same as the falafel option mentioned above. The falafels and shawarma are present inside the pita bread and hence not visible from the top in the pictures. The quantity of both is more than sufficient for lunch or dinner. My fried ordered the ‘Red Shakshuka’ which is their only section with egg offerings. 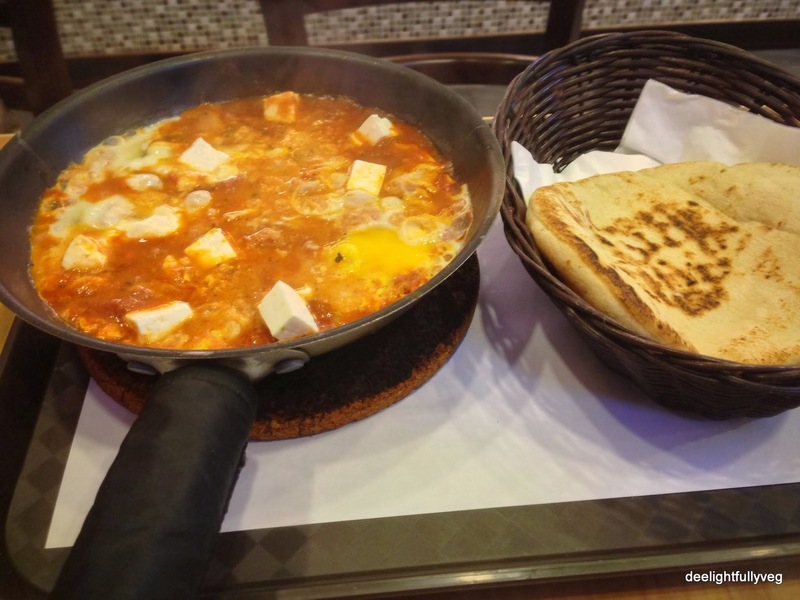 It comes in hot skillet which consists of tomato and pepper stew with eggs poached in it. Pita bread comes as an accompaniment to the shakshuka. Along with the main orders, you can also try the salads and dips which can be ordered a la carte. 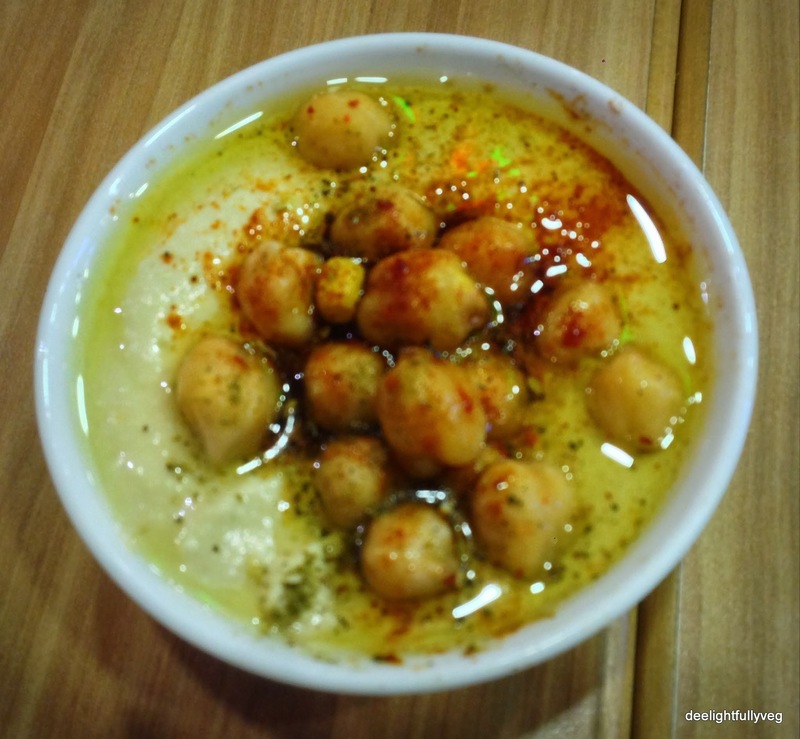 We ordered the ‘Hummus’ which was delicious to go along with pita bread. If you are looking to grab a quick bite for lunch, they also serve half pocket meals and sandwiches which can act as good take away options. Its also a nice place to catch up with friends or to conduct group meetups. 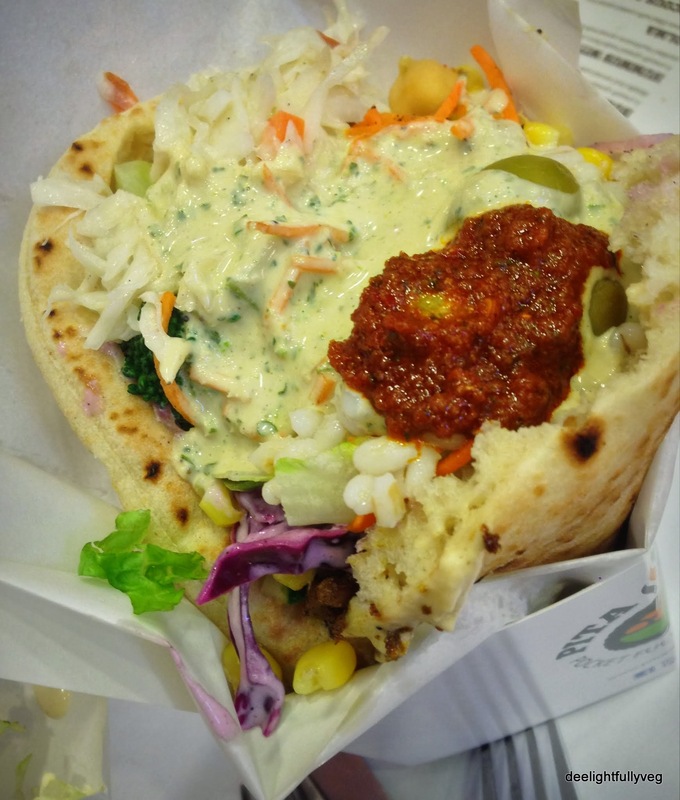 On the whole, Pita Pan is total ‘Mediterranean Magic with Pocket Full of Health’ which acts as a welcome refreshing change and is well worth a visit.